The bowl has wide rounded sides, flares towards the sloping rim, and rests on a splayed foot with bevelled edge and low disc-shaped footring. 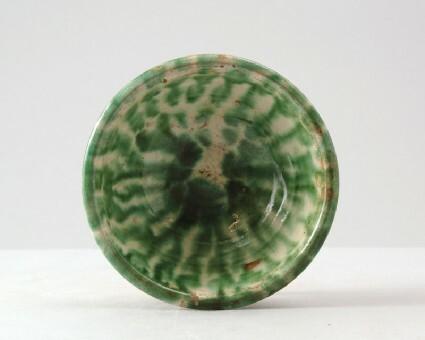 The reddish-brown body is covered with a thick white slip and a transparent glaze, decorated overall with bright green splashes. The slip stops well above the foot, the green glaze has run down further in uneven streaks and partly covers the foot.